I love, love, love using Schoolgirl Style to decorate my classroom! Do you know Melanie?? She is AH-Mazing! She really is! 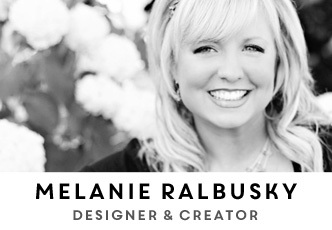 She has the best design eye and an even bigger heart! Not only does run this company, but she is a a full-time kindergarten teacher as well. You may see QUITE a bit of Schoolgirl Style in my classroom as well. I had such a blast decorating last summer and looking at the pictures below gets me pumped up to go back into my room next week! You must like Schoolgirl Style on FB and I promise you won't regret it. If you follow me on Instagram, then you probably know that I am slightly obsessed with taking the kids to Barnes and Noble for a "treat." Okay-it's a treat for Mrs. King too :) BUT every once in a while my husband will gently remind me of this thing called the public library. So last week Emmie, Smith, and I did a speed visit. Don't know what a speed visit is? Take a newborn into any quiet place and you will quickly learn! 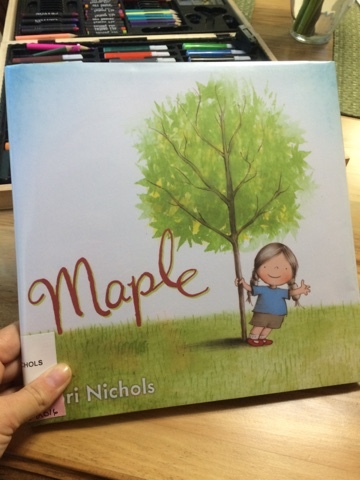 One of the books I found was this precious book: Maple! I am in a very exciting position at school where Nash and Emmie will be in 2nd grade and 1st grade which means we will all three be on the same hall. 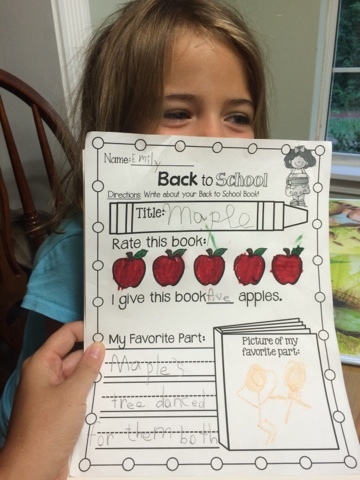 Emmie can't even stand her excitement for being a big first grader so I though I would use her help on this blog post! First of all I just want to brag on Nash and Emmie's kindergarten teacher (they had the same one because we adored her so much!). Never once did either of them feel the pressure that our school systems are putting on our young kindergartners. Their teacher kept learning FUN and EXCITING and they both adore learning. I am so impressed by the language they use when talking about books. They make connections and predictions. They even critique the writing and illustrations! ha! I am going to first tell you how I am going to be using this book in my classroom and then I am going to let Emmie take over. As a writing workshop teacher, every time I read a book I think about how I can use a book to show my students how to be authors. I will be using this book very early on in the year during our Narratives unit. 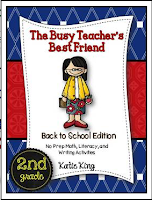 My favorite way to "use" a book for Writers Workshop is to read my students the book say at the end of the day and then refer back to it during my mini lesson the next day (actually throughout the rest of the year we will learn from it). My focus for my mini lesson with this book would be the actual structure of the story. 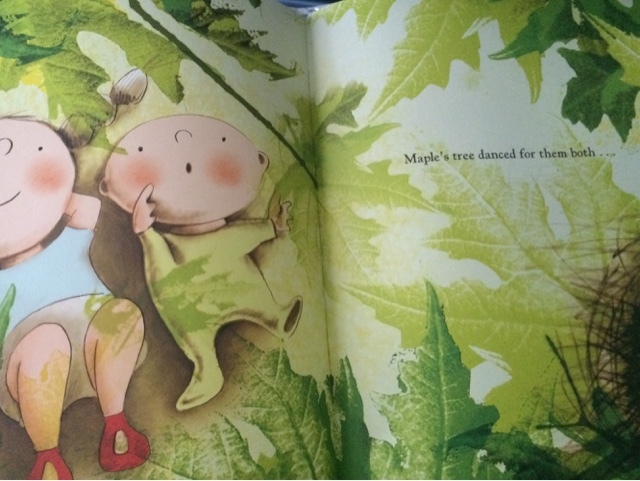 Maple starts out with a wonderful life...just her and her tree! Then like all narratives, there is some kind of problem/struggle/conflict. 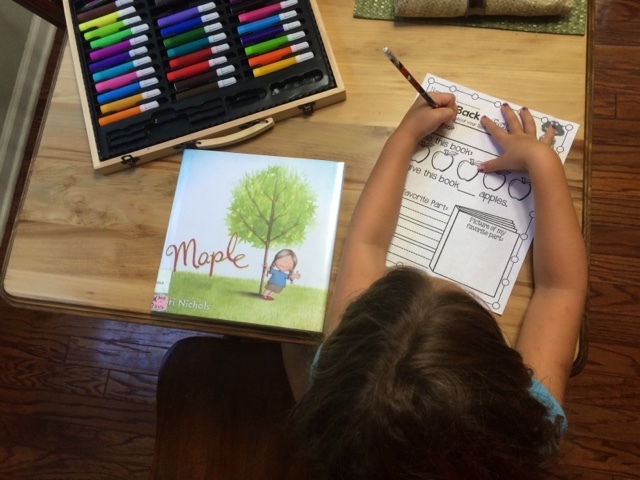 Maple's struggle is one that many first and second graders can relate to- a new baby! Then Maple learns to share something she loves with her new baby sister. The sharing just happens to lead to a solution in her problem! I think the bare bones structure of the story will allow my second graders to analyze and implement the structure in their own writing! Now- what Emmie has to say!!! 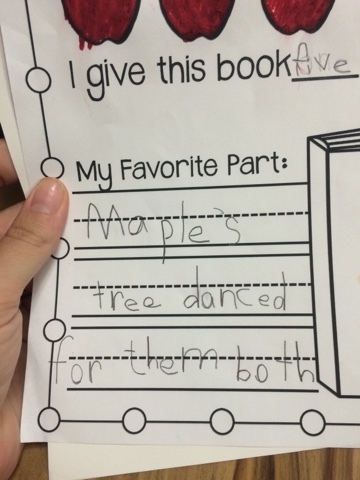 "I give this book 5 out of 5 apples, because Maple has a baby just like I do! I think Maple and her sister will grow up to be good friends. I think the tree is pretty too!" "This is my favorite part!" I wasn't allowed to share the picture with you...seems I have a bit of a perfectionist on my hands! 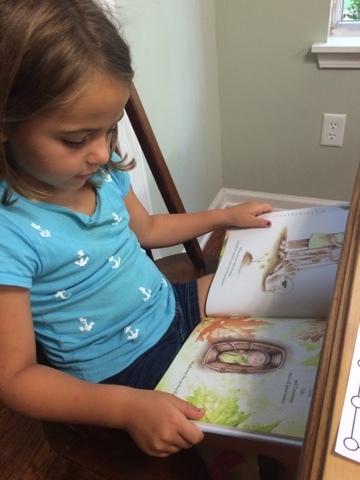 Hopefully Emmie and I will find some more great books to share with you soon. This one is definitely finding a place on my classroom shelf. 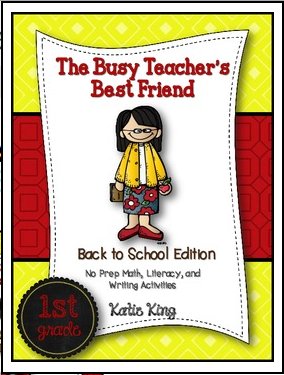 This printable can be found in my Busy Teacher Back to School Pack! Hi y'all!!! Today's deals are all about math! 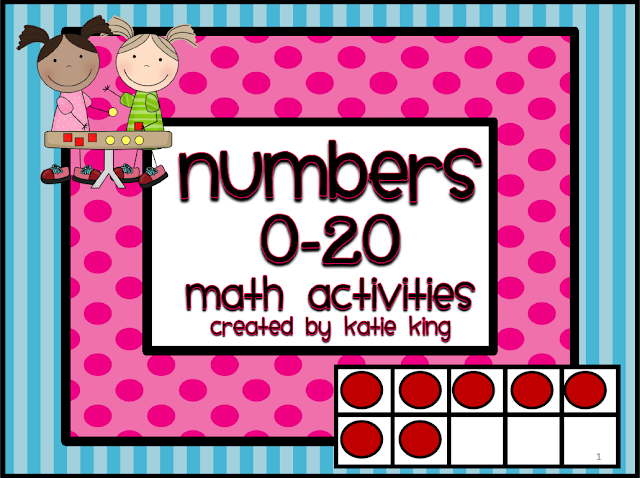 If you know anything about me than you know I am extremely passionate about students being actively involved in developing their number sense and other concepts through Math "work stations" or centers. I wrote two extensive blogs posts that explain WHY and HOW! I encourage you to check them out by clicking on the images below. The following units are all on sale today. They are all math focused. 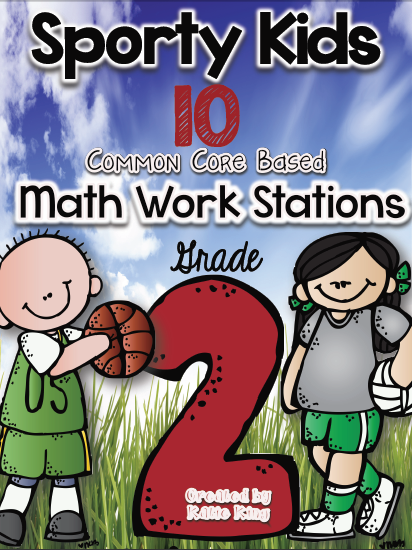 Tomorrow I will have Math/ELA combo packs on sale. And just because I love y'all, here's a freebie of mine for you to snag if you haven't yet! Now that I have my entire year's worth of Busy Teachers completed, I get slightly giddy when I go to print them out. I made them so life would be easier for us teachers, but OMG did it make mine harder for a little while :) Trust- it is all worth it now! My new way of organizing that I just love: I printed out the whole packet and put it in a 1/2 inch binder. Then I tag the pages that I 100% know that I will be using in the month. I usually have a mom come and make class sets of all the pages that I want at once. This saves me tons of time standing at the copier each month. 1. Morning Work- on days that our schedule is tight, I use these! 2. 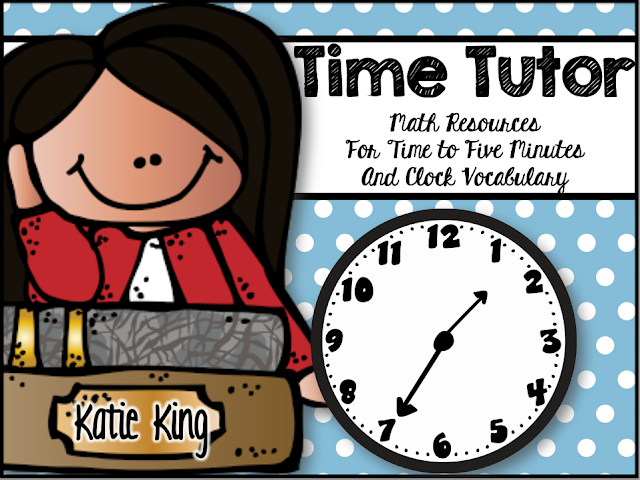 Independent Practice/Spiral Review- I haven't technically "taught" time this year, but since hour and half hour is a first grade expectation, I use my time pages as periodic review. It makes the main unit SO much easier! 3. 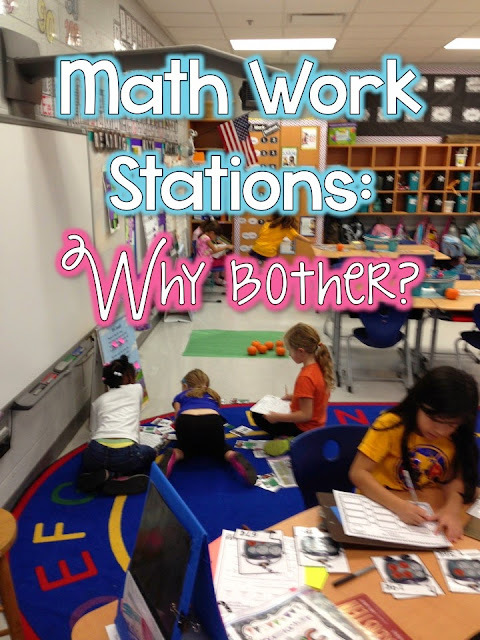 Math Work Stations- this one is pretty self explanatory! 5. Reading Response Notebooks- One of our daily routines is that my students respond to our whole group lesson/text through writing. This page is an example of what my parents would glue into their notebooks to show me their understanding of Story Elements. 6. Guided Reading/Word Work- Once again, pretty self explanatory, but in the 2nd grade world I have found one of those mandatory speed bumps many of my readers hit is the "figuring out how to decode longer, non-cvc words" phase. 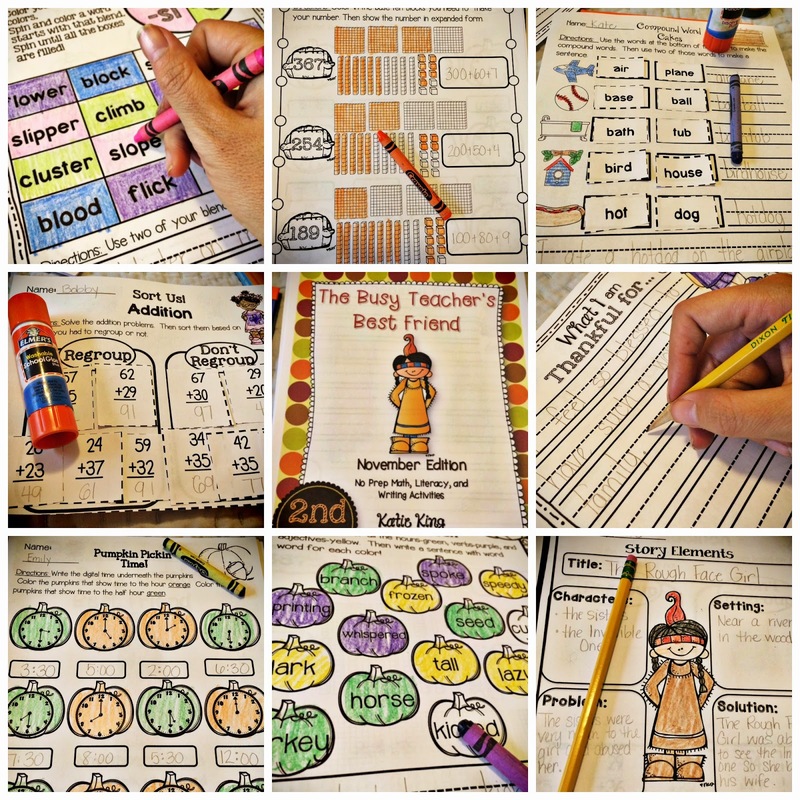 This type of page is a great teaching tool to really focus on those tougher blend words! 7. Homework- Once or twice a week I like to review an already established skill at home so I can communicate expectations with parents. I *understand* homework is a touchy subject, but based on the families/students that I have, this works for us! 8. The Occasional Writing Prompt- If you have read many of my posts, you know that I am a HUGE Writers Workshop advocate. Like the biggest. I do understand that answering questions, responding to prompts is also important though! This prompt will be used in my classroom next week! 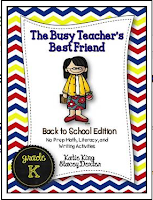 If you have never tried one of my Busy Teacher Packets, I think the Back to School packets are a great way to start! 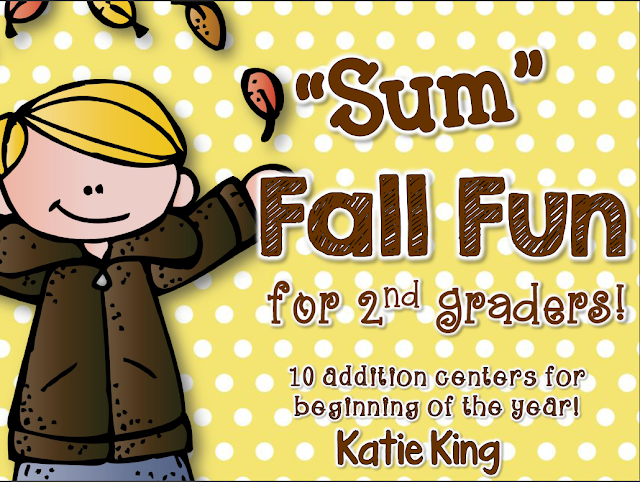 I have units for every month....Kinder, First, and Second! It felt SO good to jump back into the blogging saddle yesterday! Today's deals center around ELA units. 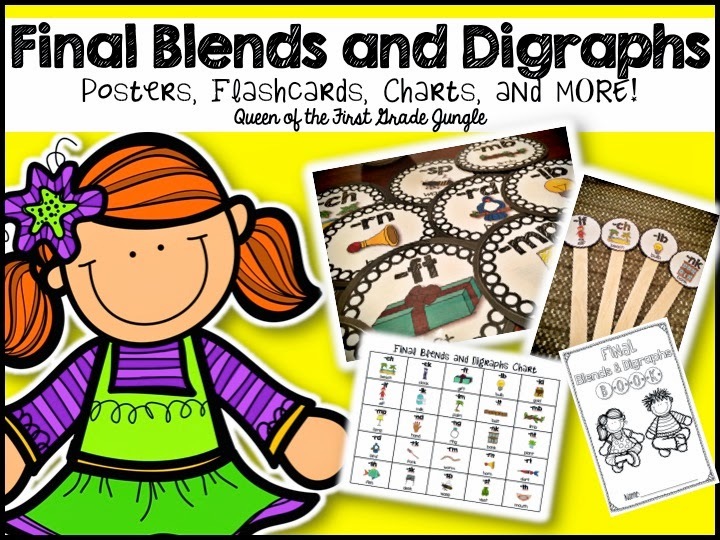 The Final Digraphs Mini-Unit is one I created for my 1st graders a couple of years. We always had a blast with it! The other three were specifically made for my 2nd graders in the last year or so. 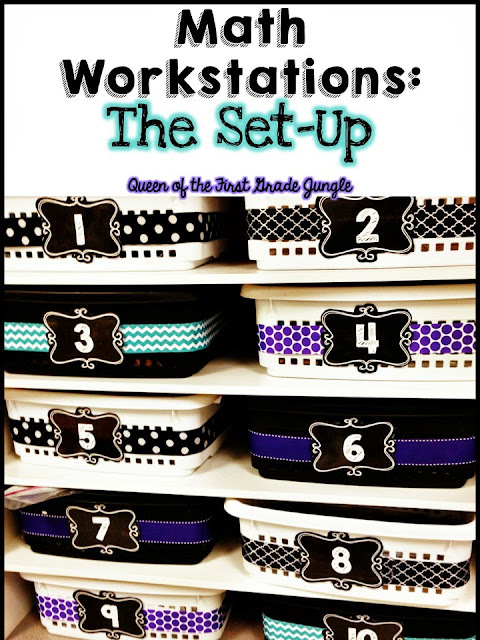 Convention Camp is one of my best selling units and it just so happens to be a favorite! Here is a closer look at my Convention Camp Unit! 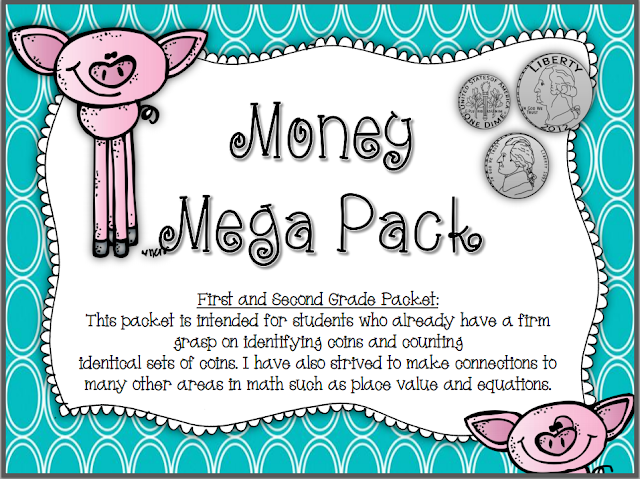 I put this packet together so I could spend about 2 weeks with my kids going over some concepts that they learned in first grade, but I wanted to make sure they were SOLID as we are big 2nd graders now! 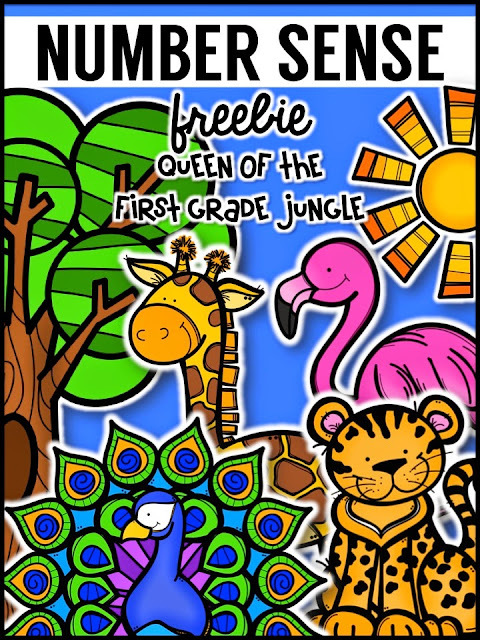 These posters can be used packed into a couple weeks OR they can hang as reminders of past concepts! And here are the centers that come in this pack. 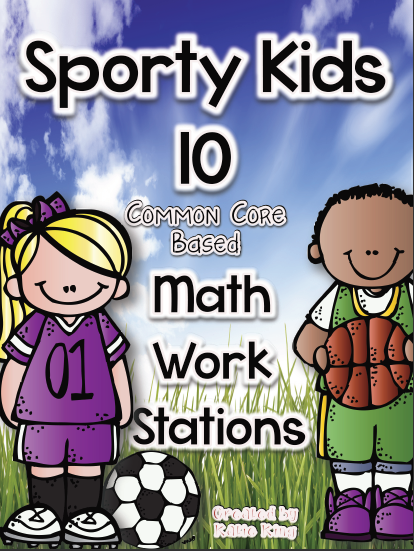 I use these centers during Daily 5 and Small Group to make sure my students fully grasp these concepts. 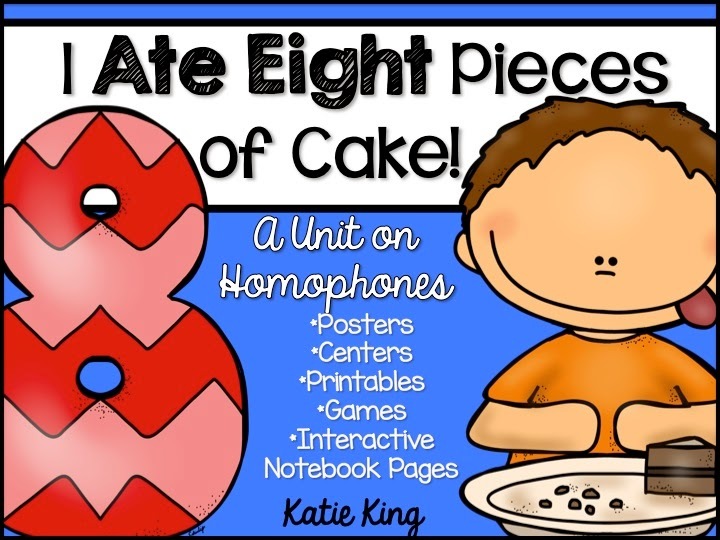 I love this Homophones Unit mostly because I LOVE seeing the light bulb go on for my 2nd graders! Here are some snapshots of my whole class intro to homophones. We used Brainpop Jr, because my kids listen to Annie ten times better than me. It's okay, I'm woman enough to admit it! ha! The video also gave us a chance to clarify homonyms vs. homophones. Then I projected our chart on the Smartboard. The kids chose homophone pairs and wrote sentences for each on their whiteboards. During my planning I was able to take my chart to our workroom and use the **MAGICAL** Poster maker. Do y'all have one of these??? I don't know how I lived before I worked at a school that had one. This is incredible! I scanned the chart, pressed 4 copies, and the machine printed and cut posters for my entire team completely on its own! Magic I tell you! 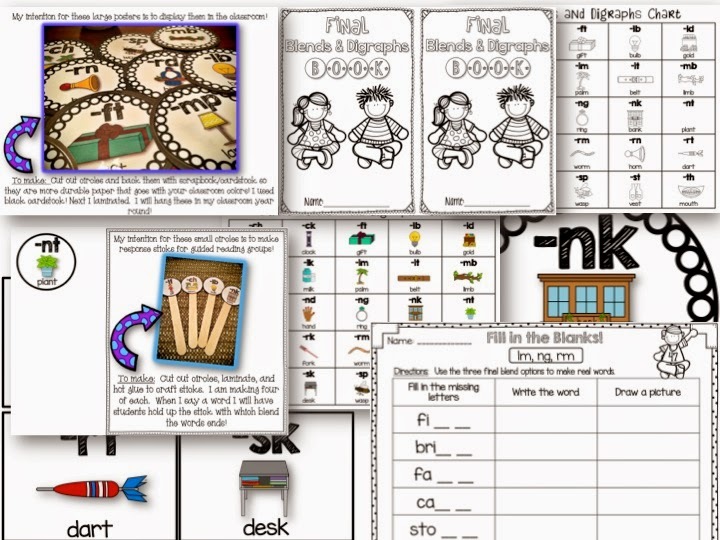 I wanted the kids to really, really focus on the to, two, too set so we used some of the printables in my pack to discuss the differences in each word's meaning. Kids referred back to this mini-poster several times to remind themselves of the meanings of the words too! 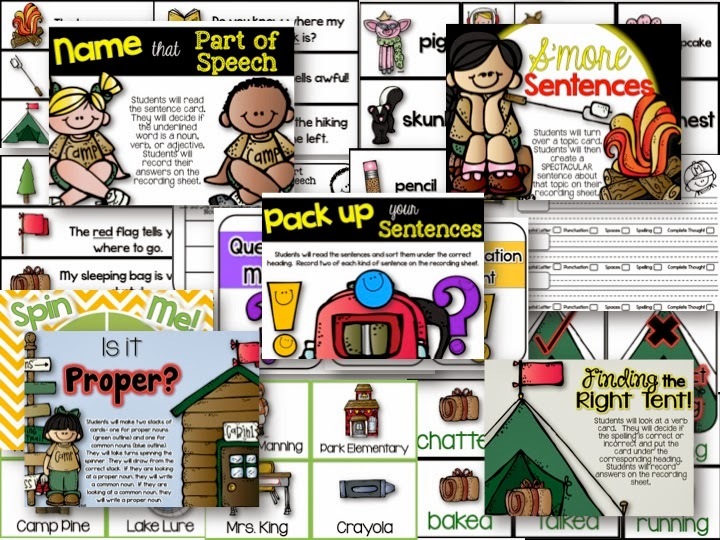 Here is a snapshot of how I started using these resources in guided reading. 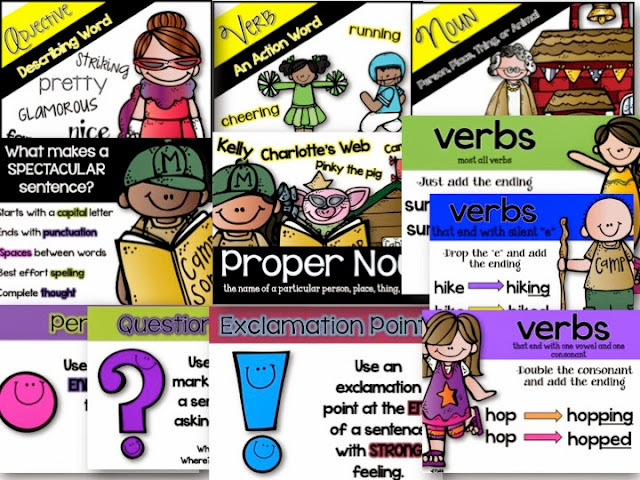 I printed out the flashcards and Homophone charts for discussion and referral when we do word work in small group. I also printed off the cards that are separate from the words so my cute little girls could practice matching them to the correct pictures! We also loved the interactive journal pages too! 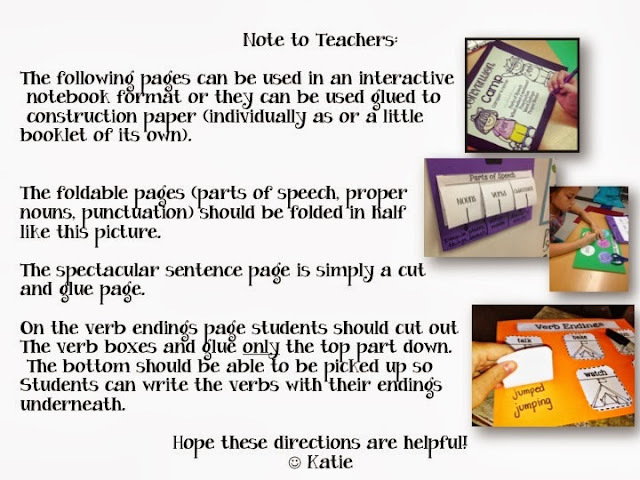 They wrote the words, definitions, and example sentences underneath. 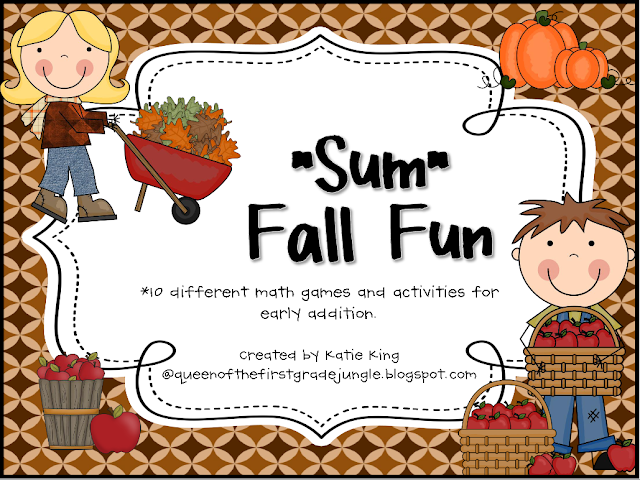 This served as great practice, and an excellent resource for reference throughout the year! I used this next resource ALL YEAR LONG. That is the beautiful about small group. Some kids are ready and willing for some concepts way before other students! I put up the posters at the beginning of the year and I referred to them all year long! We also kept the charts in our Daily 5 folder for reference during Word Work and Writers Workshop. I backed my posters in black cardstock, but you should use whatever color works best in your room! 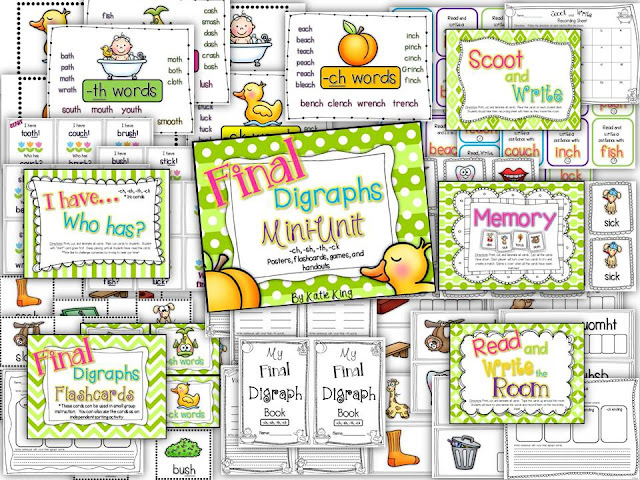 And last but not least, my Final Digraphs Unit for 1st graders! I put together this unit filled with games, posters, and handouts for you (and me!) to use with your students. I just LOVE how it all came together! Not that it is super important, but I thought the colors were just so pretty in this unit! I used the posters and word family posters during my small group instruction. My lower reading group used a huge heaping of this unit for the last couple of weeks in First Grade! The games we used as whole class review to make sure we were prepared for Second Grade! PHEW! I actually really enjoyed looking back at these Units that I worked so hard on over the years! 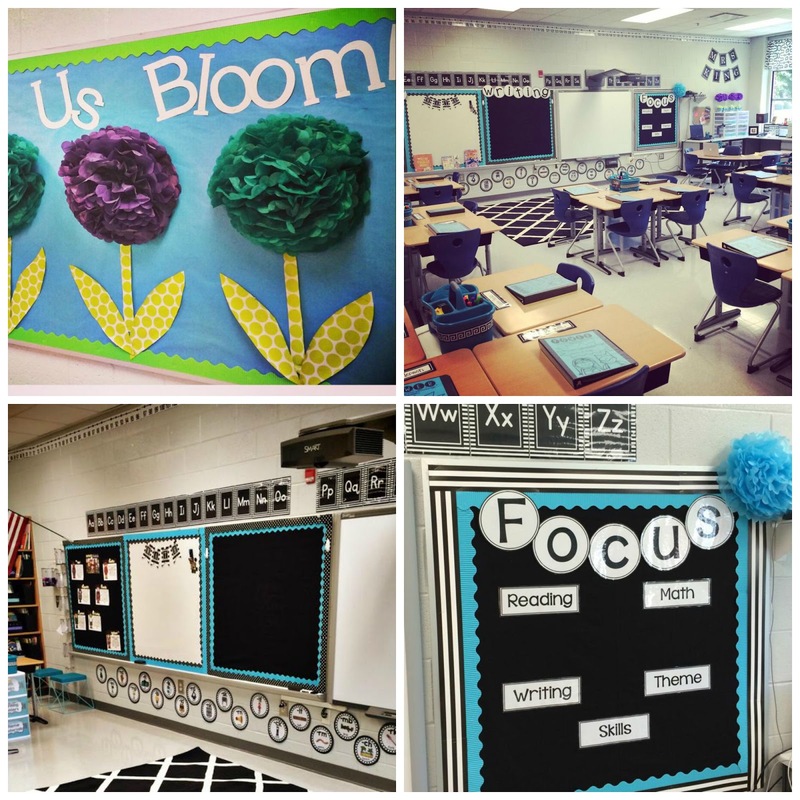 I hope that some will be helpful for you and your students! Christmas in July, Superheroes, and a Freebie!